Fire up your nuclear powered rag doll cannon and fire off some dummies! 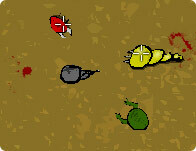 Over come obstacles, smash through boulder, walls and sneak your way around corners in this stick powered cannon game. Use your mouse to aim and gauge velocity. Left mouse button to fire. Complete different tasks as a sniper. The earth has changed.. It's been taken by aliens from outerspace. You are one of the few humans still alive, and you have to survive! Use your weapons and your wits to survive in this cruel world.